Glaucoma is a common eye condition related to elevated pressure within the eye that can damage the optic nerve. When this nerve is damaged, it cannot adequately transmit information from the eye to the brain. At our Philadelphia eye care center, we take the detection and treatment of glaucoma very seriously. Uncontrolled glaucoma can lead to vision loss and blindness. In fact, it is the second leading cause of blindness in the U.S. and the world. And of the 3 million Americans that have glaucoma, the Glaucoma Research Foundation estimates that only half of them are aware of the condition. Our goal is to detect glaucoma in its early stages, when it is more easily treatable. Once diagnosed, our board-certified ophthalmologists can control glaucoma and halt further vision loss. Glaucoma occurs when the pressure inside the eye, known as intraocular pressure, builds up to a dangerous level and damages the optic nerve. This happens because the drainage channel that controls the outflow of fluid in the eye, known as the drainage angle, becomes clogged or blocked. As a result, the eye cannot drain fluid as well as it should, or at all, and fluid builds up in the eye. 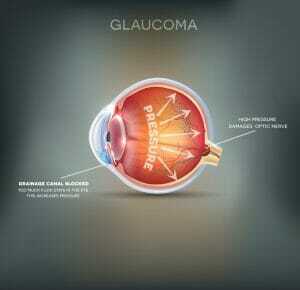 There are several types of glaucoma. In open-angle glaucoma, the angle has a difficult time draining the fluid inside the eye — imagine a clogged drain. The fluid and pressure build up in the eye and eventually damage the optic nerve. This is the more common form of glaucoma. In narrow angle glaucoma, also called angle-closure glaucoma, the angle becomes blocked, causing the intraocular pressure to rise very quickly. This type of glaucoma must be immediately treated by an ophthalmologist to prevent vision loss or blindness. Detecting glaucoma is challenging because rising intraocular pressure rarely causes pain, unless it reaches a certain threshold. Early stages of the disease can affect peripheral vision (side vision), but the changes may not be easily noticeable. Other symptoms can include blurred vision, halo effects around lights and painful or red eyes. Narrow-angle glaucoma produces symptoms like eye pain, blurry vision, halos, headache, nausea and vomiting. 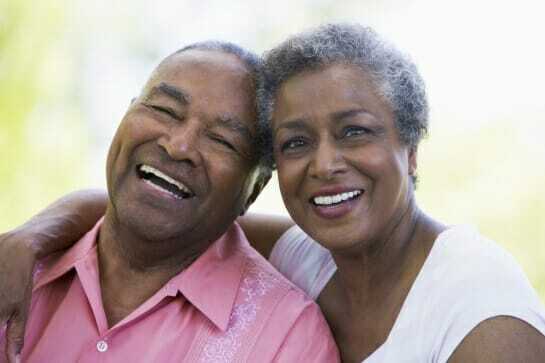 Adults at a heightened risk of glaucoma should undergo annual eye examinations to check ocular health. During an exam, visual acuity and visual field are tested, and the optic nerve is evaluated. An instrument called a tonometer is used to measure the intraocular pressure. Other diagnostic technology, called optical coherence tomography, is used to produce highly detailed images and measurements of the eye’s structures like the retina. If glaucoma is confirmed, these tests are repeated at certain intervals to determine whether the treatment being used is effective. There are several ways to treat glaucoma by lowering intraocular pressure or improving the drainage from the eye. The first line of defense is usually medicated eye drops. Certain eye drops reduce the amount of fluid the eye produces, and others help the drainage of fluid through the angle. If the eye drops don’t work, another option to surgically create canals in the outer layer of the eye to allow fluid to escape. This can be done with traditional instruments or with a laser. Selective Laser Trabeculoplasty, or SLT, is designed to reduce intraocular pressure in cases of open-angle glaucoma. During the quick and virtually painless procedure, laser light is used to trigger the body’s natural healing mechanisms to enhance the outflow of fluid from the eye and lower intraocular pressure. Only selected pigmented cells in the eye are treated with the focused, narrow wavelength, leaving the surrounding tissue undisturbed. There is no downtime, and serious side effects are rare. Depending on the circumstances of the patient, repeat treatment may be needed in the future. The team at Northern Ophthalmic Associates is committed to the effective treatment and management of serious eye diseases, including glaucoma. If you are experiencing any troubling visual symptoms or vision loss that may be glaucoma-related, please contact our office to schedule a screening.